Creatrix 2018, an intra collegiate science exhibition steered annually by the Department of Life Sciences was organized on 14th December 2018. The budding scientists of our department presented many creative ideas as exhibits. We had 67 teams with a number of 3 in each group and were named after eminent scientists of diverse areas of Life Sciences such as Pasteur, Lister, Khorana, Ehrlich, Hoippocrates, Maheshwari, Rao, etc. The exhibition was inaugurated by Dr. Varsha Sridhar, Director and Co-founder, Molecular Solutions Care Health, Bengaluru and presided by Rev. Fr. Josekutty P D, Principal, Kristu Jayanti College. 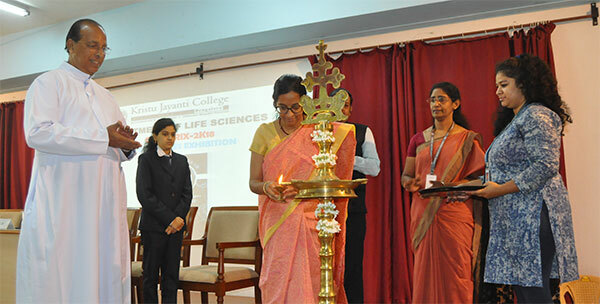 In the inaugural address, Dr. Varsha Sridhar probed the students to assess themselves and stimulated students to show innovation in all possible ways of approaching life. Esteemed Principal Rev. Fr. Josekutty P D, in the presidential address motivated students to pursue research and envisioned that the students of KJC be in the list of Nobel Prize laureates. Still models, working models, and projects were a treat to everyone’s eyes. The Exhibits were creative and attractive and some were marvelous. The exhibits included eco-friendly approach of treatment of industrial effluents, waste water treatment, working model of the heart, dialysis, vision formation in the brain etc., and the uniqueness of the exhibition was the integration of study of bimolecular events with sensors and construction of a gel documentation system at the laboratory level at a feasible cost. Alcohol sensor, called Alcohol sensor and working on sensor mechanism was designed innovatively using simple mq3 sensor which is connected to a buzzer that buzzes to indicate alcohol as low as 0.03%. Pulse Meter consisted of a sensor with LED connected to a laptop programmed to detect the pulse and displays your pulse rate graphically both. Adaptation of a novel approach of cleaning waste water from domestic and industrial wastes using corn cobs through adsorption techniques connected to a turbidity sensor was exhibited. Eco-friendly approach of making homemade bioplastic using banana peels and other available homemade ingredients and waste water treatment using electrobacteria Shewanella oneidensis that has the potential to purify water 10 times faster than the conventional methods was informative. Exhibit of self-sterilization of door handles of public toilets using Arduino board sensors was at its infancy but very promising for the prevention of infection. .Such exhibitions have to be encouraged because students get an opportunity to present their ideas. New ideas grow in the minds of children. If they cannot present or express them it is of no use. So exhibitions are opportunities where ideas will begin to bloom for the development of the world. SRK microscope self -named after a team’s innovative approach to visualize the image of the object on the screen of a laptop using an inbuilt image sensor and with less strain on the eyes was indeed a great idea. The entire microscope including the coarse adjustment knobs were made using card board. Attention-grabbing exhibit was gel-documentation system built in the form of bio pyramid fitted with a camera on the top and controlled by laptop/phone using software. This exhibit had it uniqueness of being compact, easy to use and very important being cost – effective. With further improvements it could be definitely be affordable at a lower price as compared to the market price without being compromised on the quality. All the exhibits were exceptional and remarkable, and as encouragements for their hard work 3 best exhibits were chosen as winners. Thus the event, aimed at innovativeness and creativity of various working and static models. This year also the students as a team made the event a grand success. Creatrix 2015, The Life Science exhibition was organized by the Department of Life Sciences, Kristu Jayanti College, on Wednesday, 21st Jan 2015. The exhibition showcased a relay of lively exhibits that depicted various concepts in Biotechnology, Biochemistry, Microbiology and Genetics. The event was inaugurated by Fr. Josekutty, Principal, Kristu Jayanti College in the Mini auditorium I. A total of 30 stalls were set up displaying models and posters. The presentations were made with the aid of working models, posters and live demonstration. An interactive fun zone conceptualized in science was also part of the exhibition. Live demonstrations included simpler and rapid methods of DNA extraction, Natural dyes which can be used as pH Indicators, Water purification process with the help of reverse osmosis and reducing hardness of water by natural filtration methods. The students of Life Sciences Department conducted an exhibition on the 20 of March 2013 from 12 pm onwards in the Mini Auditorium 01. The exhibition was inaugurated by our Principal, Fr. Sebastian TA. Ms. Romeena Thomas delivered the welcome speech. All the under graduate students were the active participants of this event. Through various charts and models the students portrayed the present issues and scenarios related to environmental safety and self-awareness of various energy resources of our Earth. Students and faculties from other departments visited the exhibition. On the whole it went smoothly and it was a good platform for the students to show their creativity. The department of Life Sciences, Kristu Jayanti College under the auspices of the three science academies - Indian Academy of Sciences, Bangalore, The National Academy of Sciences, Allahabad and Indian National Science Academy, New Delhi organized the Science Academies Lecture Workshop on “FRONTIERS IN BIOLOGY” on 23& 24 September, 2013. The workshop was attended by 222 students, of which 97 participants were from 9 different colleges, 110 students and 9 faculty members from Kristu Jayanti College. The second lecture on “NON- CODING RNAs” was presented by Prof. Kumar Somasundaram from the Department of Microbiology and Cell Biology, IISc. Differences between the coding and non-coding RNAs, different types of non-coding RNAs, relevance of microRNA in cancer were the highlights of his lecture. The lecture also included a brief presentation on cancer, methods to quantitate miRNAs and an overview on Glioma- the most common brain tumor arising from glial cells. The third lecture on “DNA REPAIR AND CANCER” was presented by Prof. Sathees C. Raghavan from the Department of Biochemistry, IISc. The lecture started with the introduction to cancer, oncogenes and protogenes. He moved on to the major DNA repair mechanisms involved in human system like mismatch repair, excision repair, bypass repair, double strand and single strand repair. DNA damage as the cause of formation of cancer cells was emphasized during the lecture. Dr. Sathees also touched upon various techniques used in cancer research. The fourth lecture on “CANCER STEM CELLS: THE TROJAN HORSES WITHIN CANCER” was presented by Prof. Annapoorni Rangarajan from the Department of Molecular Reproduction, Development and Genetics, IISc. The main focus of the lecture was on the role of stem cells within cancer tissue in the genesis of cancer, stages of origin of cancer which includes the stages of senescence, immortalization and transformation. Major models for carcinogenic studies like stochastic and hierarchy model were also discussed. The fifth lecture on “Genetics of Geometry: How genes regulate biological shapes” was presented by Prof. Utpal Nath from the Department of Microbiology and Cell Biology, IISc. He presented the rules for the growth of organism based on the gradients of growth and differentiation. He explained the mechanism of allometry based on the diversified expression of miRNAs and growth regulating factors (GRF). He concluded his lecture citing the application of these studies in plant tissue culture for selecting the best explants. The second day of the lecture workshop started with an overview of Bioinformatics by Prof. Nagasuma Chandra from the Department of Biochemistry, IISc. Dr. N. S. Chandra explained bioinformatics as the coherent framework to integrate various biological resources. Other highlights of the lecture included the major areas in bioinformatics, an overview of sequence analysis and advantages of protein sequence analysis and efficient utilization of the information contained in the databases.